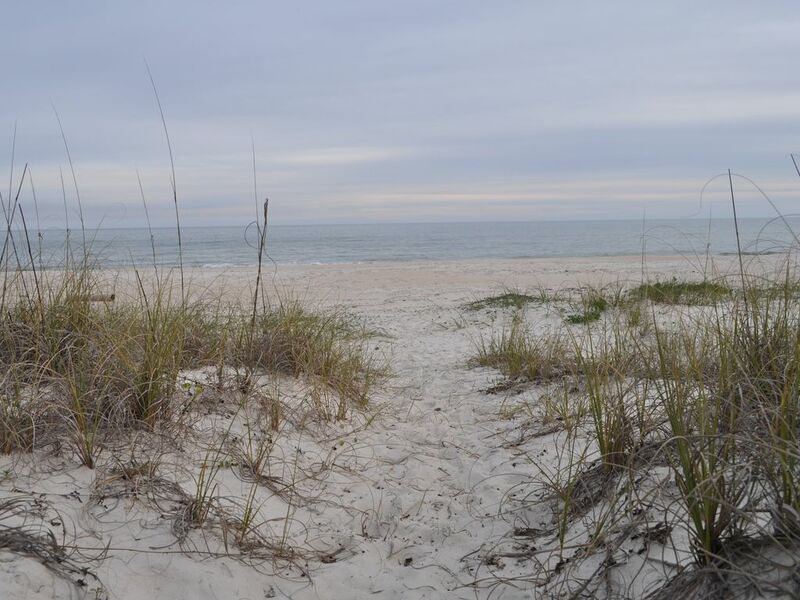 Come swim with the dolphins, fish from the beach, walk the white sands of St. George Island, or relax on the hammock in this newly remodeled home. Your whole family will enjoy this spacious beachfront house. Wake up to magnificent sunrises and take in awesome sunsets from the open sundecks or recline with a book on the large shaded deck. Prepare your fresh catch in the well-equipped kitchen furnished with all new stainless appliances. This uncrowded beach offers the perfect getaway for some relaxation or for that big family get together. 3 Full newly remodeled baths. Tile showers, granite counters, tile floors. Master has a huge walk in shower with bench and separate oversized bathtub surrounded by glass tiles. Beautiful beach front views from this bathroom. Take the short boardwalk from the house to the beach! Large living area with 2 sofas and 3 chairs. Large television. Fully equipped kitchen with granite counter tops and stainless steel appliances. Large dining table with 6 chairs. Kitchen has 5 barstools that pull up to the large kitchen island. Various card games, backgammon and children's toys located in the t area on the top floor. Exactly as advertised. Nice stay. Definitely will return. Great family reunion in a wonderful beach house!!!! We enjoyed our time at this beautiful house on St. George Island. Family reunion in a house large enough for all to be comfortable and just steps from the water. This is my favorite vacation home ever! The house is awesome, the beach is grand and the owner was extremely accommodating. We had the time of our lives! We are going to try to get this property on a yearly basis! The perfect home for families and friends. The owners strive to have our vacation stay rejuvenating and relaxing all at the same time. The home is very accommodating and spacious, we had everything we needed at our disposal. Add in an incredible beach, glorious sunrises and sunsets, and amazing star viewings, memories are made here. Definitely hope to return to Hakuna Matata! Wonderful home to vacation in! Hakuna Matata is a wonderful home-away-from-home place to stay!! So much space, we weren't tripping over each other. Loved the pocket doors to block off a sleeping area so one could wake up and move around without waking others. The beach view can't be beat! Loved watching the dolphins from the porch while enjoying a wonderful breeze! I will be back! My friends and I stay here every year to get away from it all. We have such a wonderful time. The house is beautiful and has ample space for all of us. We are never in need of anything and enjoy ourselves immensely. You should try it! House is located on St. George Island, in the panhandle of Florida. Also known as 'The Forgotten Coast'. St. George was named in the top 10 beaches this year(2013).